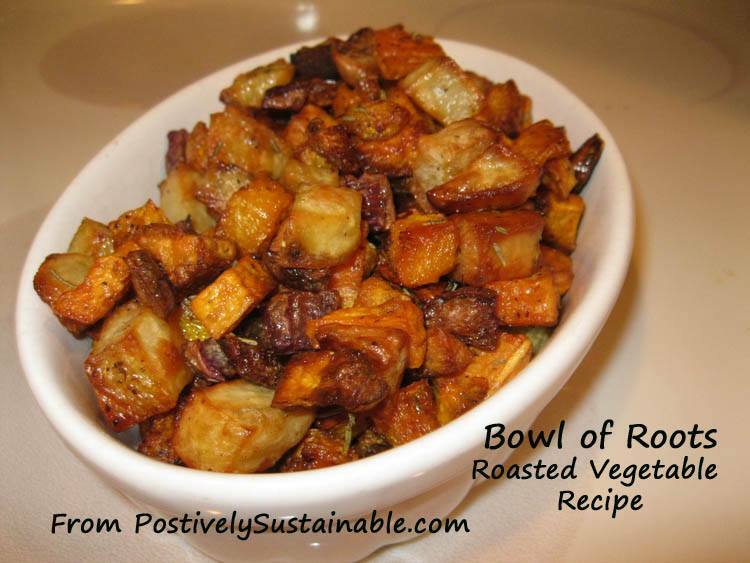 In the winter a wonderful side dish or vegetarian main dish is roasted vegetables made of “roots”. 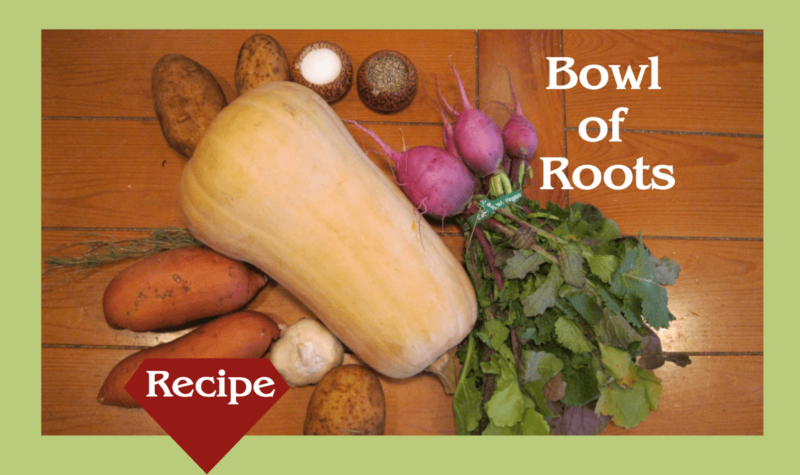 The ingredients used are up to you, but roasted roots, loosely defined to include potatoes, winter squash, yams, garlic and even turnip make a wonderful roasted vegetable dish. In this simple roasted vegetable recipe you can prepare the cut vegetables the day before since the vegetables are hearty. 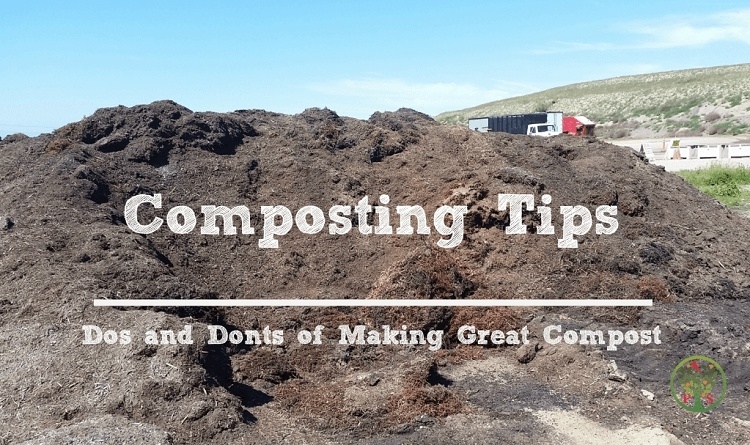 Since this is a slow roasting process, this can also be roasted the day before and simply re-heated in the oven. Microwaving will make them soggy. If you are using potatoes and want to avoid them turning brown, then hit them with a splash of vinegar as you cut them up. Download this recipe card by clicking on the image. 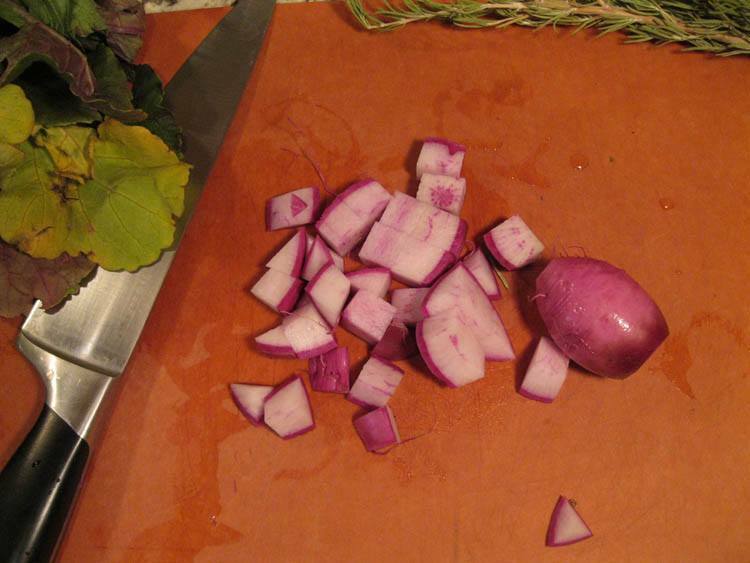 Slice the turnips, or other root vegetables into 1 inch cubes. 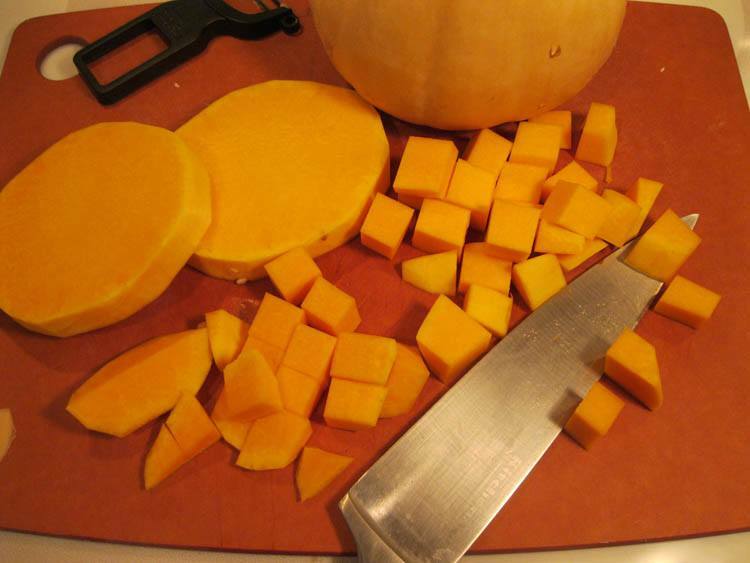 Many nutrients are in the skin of these root vegetables so it is ideal not to peel them. 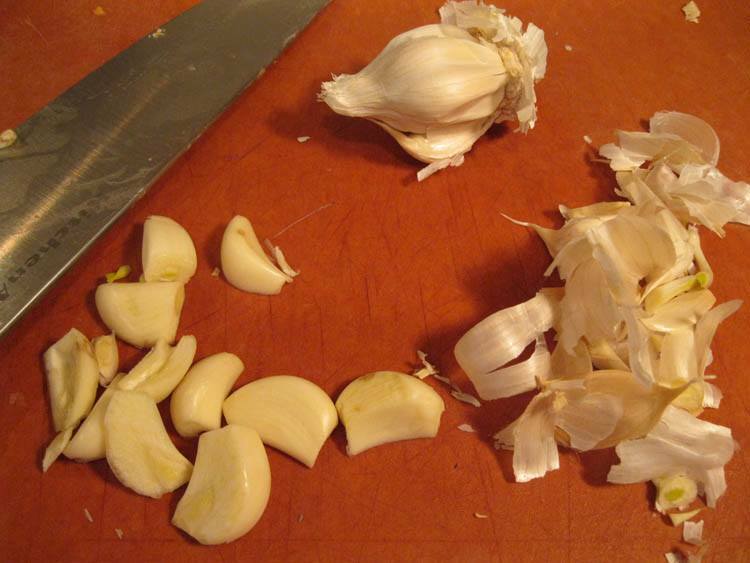 Peel the garlic and slice them in half. Ideally if there is a green shoot in the center, remove the shoot. This sometime has a bitter taste. Add your favorite herb to the roasted vegetables. 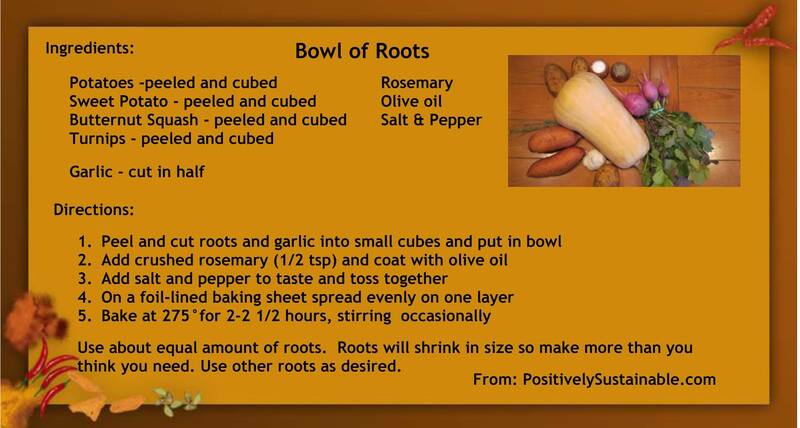 Rosemary provides a depth of flavor that pairs well with the root vegetables. 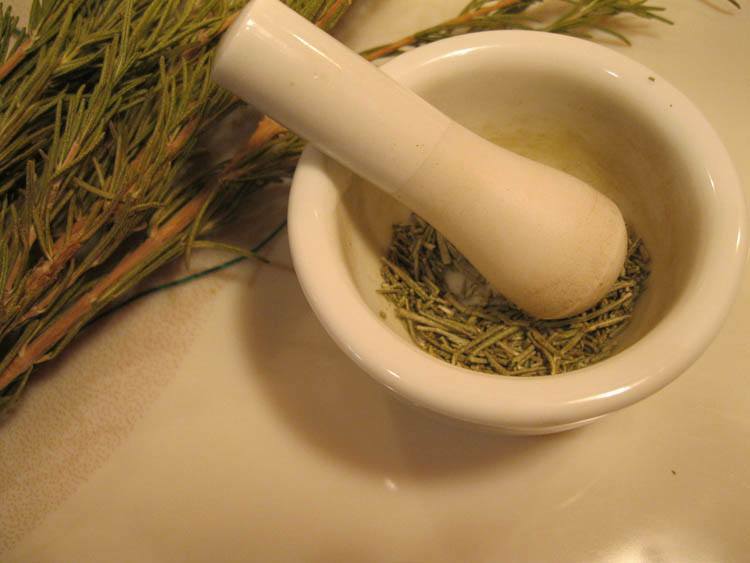 Chop the rosemary or use a mortar and pestle to finely chop the tough leaves. About 1-2 teaspoons is all that is necessary. 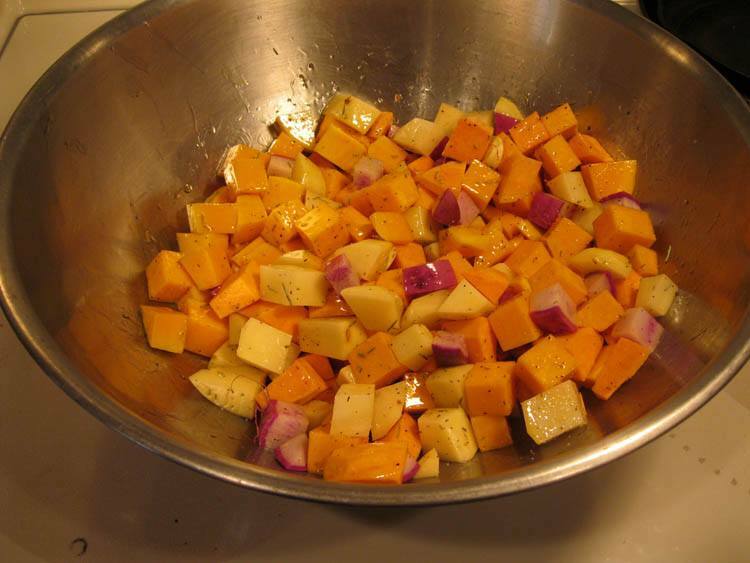 Place all of your chopped root vegetables in a large bowl. 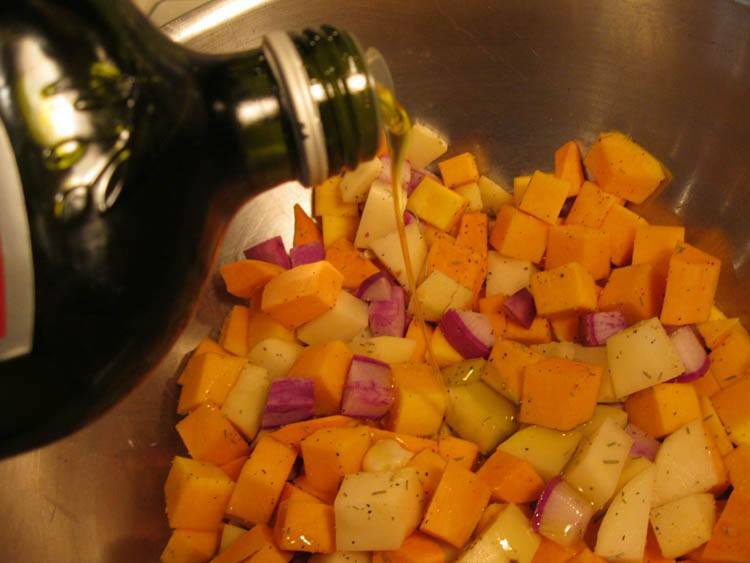 Coast all the root vegetables lightly with olive oil. 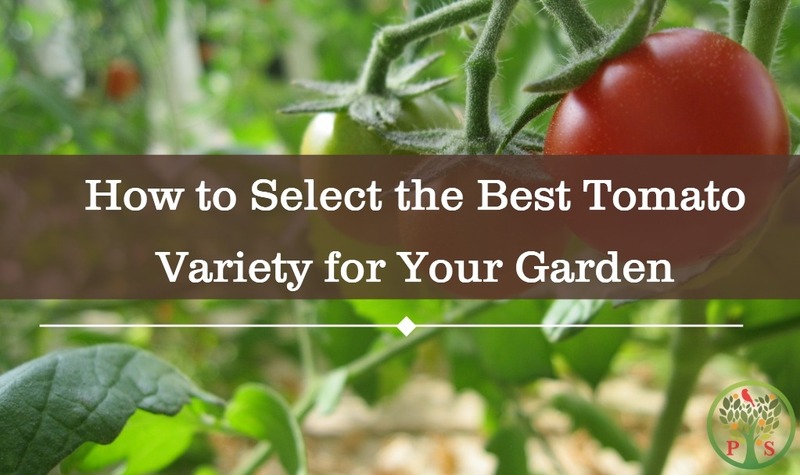 Alternative oils that could be used include olive or peanut oil. Avoid canola oil, since this oil is largely made with GMO ingredients. 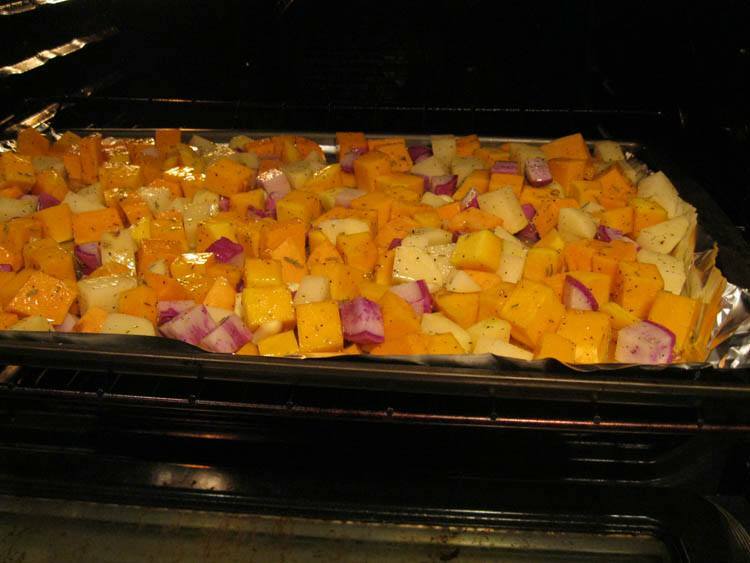 The dense, low-moisture vegetables (like the roots and squashes in this recipe) need low heat and time in the oven to develop that lovely roasted profile. 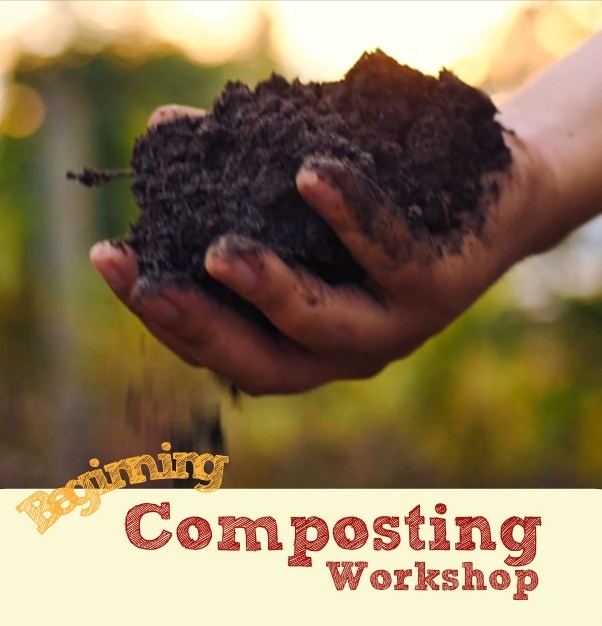 Higher moisture vegetables such as eggplant or zucchini require like shorter cooking time. As such don’t mix and match with this recipe. Stick with the root vegetables. Place the oil coasted vegetables on a cookie sheet. 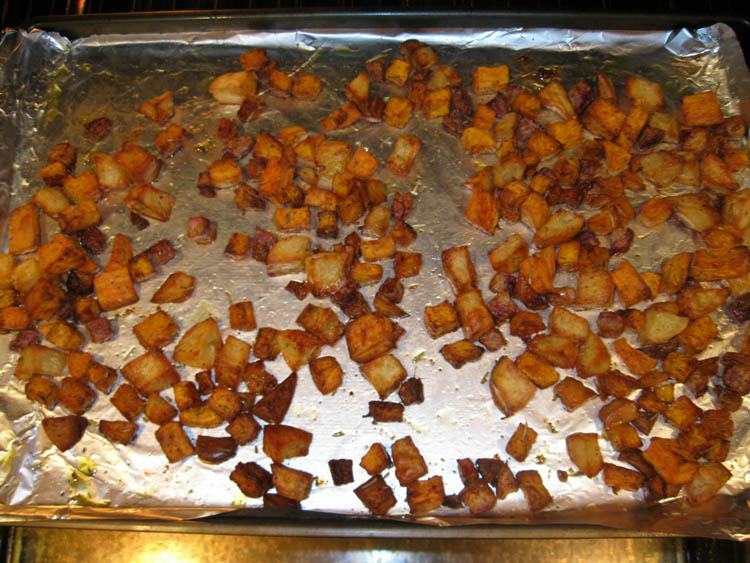 Parchment paper or foil will reduce the clean up, but that is optional. Place in a 275 degree oven and roast for two to two and a half hour. Lower temperatures such as roasting at 250 degrees will add to the carmelization, but will increase cooking time. Cooking at higher temperatures such as 300 will shorten the cooking time to about 1 1/2 hours. The roasted vegetables will shrink up considerably. Cook until slightly crunchy on the outside – this carmelization will be the hit of your friends and family.